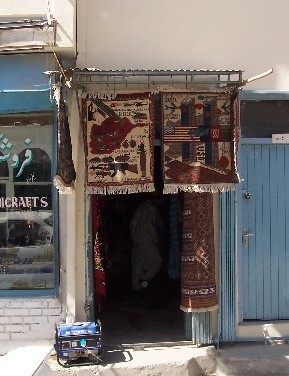 Two tapestries adorning a doorway on Kabul's famous "Chicken Street" carry messages that will seem paradoxical -- one disturbing -- to most western observers. The first commemorates the overthrow of the Taliban, a regime change accomplished through US intervention after Al Qaeda attacks on US soil that destroyed the World Trade Center and killed thousands. 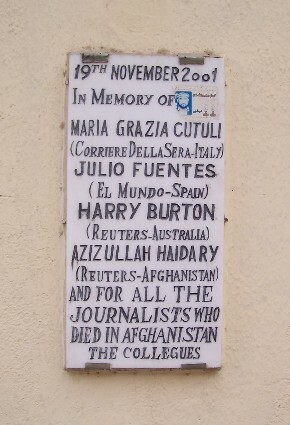 The second commemorates those attacks. Among the forces working to sustain extremist organizations like Al Qaeda is one that policymakers don't like to talk about in direct terms -- drug prohibition. The United Nations and leading development economists put the proceeds from Afghanistan's black market opium economy at $2.8 billion, with about $600 million going to farmers and more than $2 billion going to regional drug trafficking organizations, warlords linked to the Afghan government, and other political figures. These prohibition-derived profits are fueling corruption and distorting the political process in Afghanistan and financing Islamist radicals and nationalist insurgencies from Central Asia to the Middle East, according to a variety of sources. After an August trip to the region coordinated with the US Central Command, Clinton-era drug czar Gen. Barry McCaffrey, now a professor at West Point, told the Washington Times last week that black market opium profits are energizing Al Qaeda and the Taliban in Afghanistan and the ungovernable tribal territories across the border in Pakistan, and widening the drug trade into the Persian Gulf and Iraq, where its illicit profits may be helping to finance the insurgency there. US officials are reluctant to link black market drug profits to the insurgencies in either Afghanistan or Iraq. The US Embassy in Kabul, for example, Wednesday told DRCNet that it had "no press guidance" on the link between drug profits and an apparently revitalized Taliban/Al Qaeda insurgency in Afghanistan. The Washington Times reported last month that US officials are loathe to make the connection because they fear US forces there would then be forced to take an active role in combating the trade, a task the US and UN have largely dumped on the British, even though the US has budgeted hundreds of millions of dollars to combat the trade this year. But for McCaffrey the link was obvious. "Is there a relationship between $2 billion in this impoverished 14th-century desperate land, and the appearance of brand-new guns and shiny camping gear? Of course there is," he said. It's not just Afghanistan, said McCaffrey. "We are seeing bunches of opium and heroin appear in the Persian Gulf, headed into Iraq," he added. It is not just observers like Gen. McCaffrey who are sounding the alarm. In a meeting with UN Office on Drugs and Crime (UNODC) director Antonio Maria Costa last month, Russian Federal Drug Control Service Director Victor Cherkessov raised similar concerns. "The influence of Afghan opiates extends beyond the drug trafficking and drug abuse ramifications, but has far-reaching impact since it is linked to corruption and financing of terrorist activities," he said. Russian Defense Minister Sergei Ivanov echoed that warning earlier this week. In remarks reported by RIA Novosti, he said Afghanistan is now the main threat to Russian security because profits from the drug trade are financing terrorism. Ivanov called on NATO to cooperate with the antiterrorist Collective Security Treaty Organization (CSTO) members Armenia, Belarus, Kazakhstan, Krygyzstan, and Tajikistan in fighting the traffic. But while NATO forces are responsible for security in Afghanistan through the International Security Assistance Force (ISAF), ISAF members, speaking on condition of anonymity, told DRCNet they were not interested in getting involved in a drug war. "This is not our mandate," a Swedish ISAF member said. "Of course, this is ultimately a political decision, and if we are ordered to fight the opium, we will do so. But no, we are not really interested in getting caught up in that." "Drugs are not the source of conflict in Afghanistan, but they fuel it," said British international law expert Hugo Warner during a "drugs and conflict" workshop at the Senlis Council's Kabul symposium last week. "The Taliban is clearly involved in trafficking into Pakistan, and the ability of Afghan warlords to maintain and arm their militias is clearly connected to the drug trade." It's not just the Taliban and rogue warlords getting rich off the trade. "A high proportion of Afghan elites are involved in the trade," Afghan expert Barnett Rubin told reporters during a break in the symposium. The United States remains firmly committed to drug war-style policies in Afghanistan. US Embassy press attaché Lou Fintor told DRCNet the US government was "encouraged" by the slight progress made in reducing opium cultivation this year. "The government of Afghanistan has engaged in a broad strategy to combat poppy cultivation, which the US fully supports," Fintor said. "The US is working closely and cooperatively with the United Kingdom, the United Nations, and other donor countries to assist Afghan officials in eliminating the poppy trade. We are determined to increase our efforts to support the Afghan government in reducing the cultivation of and trafficking in illegal poppies." But such policies are counterproductive and probably doomed to failure, said experts. "The hope that attacking the illicit economy will weaken terrorism and guerrillas is just a hope," said British international law expert Hugo Warner during last week's Senlis Council symposium. "It has never worked out." "What we need is the rule of law, not the rule of force, and the rule of law must be consensual," said International Antiprohibitionist League head Marco Perduca during the symposium workshop. "If we impose a system that prohibits growing a plant, that is not going to work." Instead, said Perduca, the UNODC "should engage donor countries and Afghan authorities in a brain-storming exercise to assist Afghanistan in reconstructing itself in harmony rather than in destroying the supposed evil that is produced by drugs. The current framework of counter-narcotics policies is not only ineffective and costly but will not be able to win the hearts and minds of the Afghan population that will continue to live in an 'informal' society where more than 50% of its GDP is illegal because it is opium-based." "These prohibitionist policies always have unintended consequences," said former UN drug control program supply reduction and law enforcement chief Tony Snow. "The institutions that make up the international drug policy framework still stubbornly refuse to learn from their mistakes." While the experts are calling for a new path, the US, UN and Western powers appear committed to more of the same old prohibitionist policies, with all the evils they engender. With a tougher fight against the opium traffic the only option the West is considering, it appears to be guaranteeing a war without end in Central Asia and the Middle East, paid for by the profits made possible by prohibition. Meanwhile, the Saudi government is reporting a similar dynamic at work in Iraq -- only this time with cannabis as the illicit commodity. Sunni insurgents infiltrating the kingdom from Iraq are smuggling Iraqi weed in and carrying dollars for the insurgency out, Saudi security sources told the London-based A-Sharq Al Awsat newspaper last week. "In the space of one year, border police intercepted 10 tons of cannabis coming from Iraq," a Saudi source said. "In the past, the [smuggled] merchandise used to consist of alcoholic beverages and prohibited drugs," he told the newspaper. "We have reason to believe that profits from drug smuggling have been financing militants who are fighting Iraqi and coalition forces and facilitating the illegal entry of people into the country," the source said. "It also supports Al Qaeda's terrorist activities inside the kingdom."